Address: 1011 Budapest, Bem rkp. 16-19. The hotel has 165 rooms. 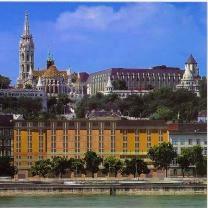 The 4-star Art'otel Budapest is located on the Buda side of the Danube River. It provides a pleasant view of the river and the parliament building. The hotel is dedicated to D. Sultan, the contemporary American artist. His works of art are on display throughout the hotel, including the guest rooms. The hotel is an interesting combination of a modern building and four restored 18th century baroque houses. Airport: 18 km km >> Order your transfer! Situated on the Danube embankment, facing three of the landmarks of Budapest, the Parliament, the Chain Bridge and the Castle District. Like a gallery, the entire hotel has been dedicated to D. Sultan, a world-renowned American contemporary artist. A multimillion-dollar retrospective of his artwork is on display in public spaces and in each room. The building complex features design hotel ambiance and integrates four restored baroque houses dating back to the 18th century. Non-smoking floors, rooms for disabled persons, fitness center, sauna and relax room, art galleries, boutiques, two-level underground parking.